The contrasting landscape between North to South and East to West of Lake Garda, the diversity of terrain and scenery, and the amazing views, make walking and hiking in Lake Garda a ‘must do’ for anyone who is serious about the activity. There are walks and hikes for all levels, from a casual stroll at the waters edge to climbing the highest peak of Mount Baldo at 2220m. Whether you want to experience fascinating nature, stunning views, sleepy villages, historic buildings or a mixture of all of these, you can be sure to find a walk that will match your mood and ability. Snow capped mountains during the winter, a myriad of colours as spring flowers bloom and trees blossom, the summer in all its glory, the richness of the autumn as the hills and mountains are lit up with red, orange and yellow, every season has so much to offer. The Parco Alto Garda Bresciano covers mountain area to the North West of the lake and includes the municipalities of Salò, Gardone Riviera, Gargnano, Limone sul Garda, Magasa, Tignale, Toscolano Maderno, Tremosine, Valvestino. It offers and endless opportunity for walking and hiking in Lake Garda with spectacular nature with stunning views. To the north-east of the lake the landscape is dominated by the imposing Monte Baldo. Its ridge spans the two provinces of Trentino and Veneto and is accessible by cable car. The views from the top are awesome and for those considering a walking or hiking holiday in Lake Garda you might want to include a trip up Monte Baldo in you itinery. The Morenic hills dominate the land to the south of the lake where vinyards and olive groves fill the gently sloping land. The walking may be slightly easier but it is by no means less spectacular as the picturesque country side provides and endless array of beautiful and historical landscapes. I’m lucky I get to walk here all year round and experience the seasons as they merge into each other. Spring and/or the autumn. April, May, June, September and October are still warm enough to enjoy the other aspects of a holiday in Lake Garda, but not so hot to stop you experiencing some of the truly fantastic routes. In the spring you will get to see the thousands of pretty flowers that line the sentieri(routes) and also you have a better chance of clearer views of the lake, which in the mid summer become fewer as the haze builds above the lake. When the autumn arrives and the leaves change colour it truly is an awesome sight to behold. Also at this time of year you can collect chestnuts and, if you know what you are looking for, mushrooms. If you are a serious walker/hiker then walking and hiking in Lake Garda is a holiday you should consider. 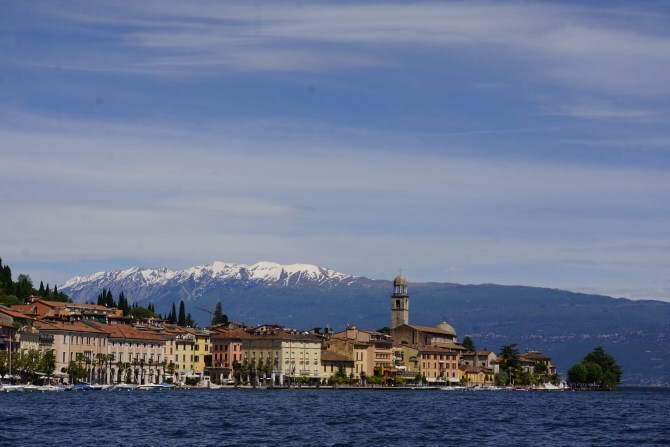 If you have a casual interest and are already considering a holiday in Lake Garda, then pack your walking boots or shoes. There are hundreds of guidebooks in the shops in the towns around the lake, but to get an idea, take a look at go4awalk.com. My favourite guidebook can be purchased at Hotel Colomber which is located in St Michele, a small village in the hills above Gardone, click here for the online version. From here you can commence many beautiful walks and return in time to eat lunch or dinner in their fantastic restaurant. I like the guidebook because it is easy to follow, it is actually an aerial map with very few words and it shows accurately all the sentieri around the Bay of Salo, and up into the hills and mountains behind Gargnano. Of course, keep checking these pages and also search the posts in the blog where I will continue to update with routes, maps and photo’s. Click on the icons in the map to get details of our routes. My son and I are looking for a two-day hike with two overnights. We were hoping for the Dolomites with stays in Refugi, but apparently they are not open that early (June 11-13), and too far (we are starting from Bologna and will go to Venice after the hike). Are there similar hikes around Lake Garda with Rifugi-style accomodations? And where would you recommend hiking with few tourists, more countryside? The Tremosine region is very good as is the Parco Alto Garda, they are on the north west shore of the lake. I will email a couple of contacts I have to find out when the rifugi open, but most of them just say mid June so maybe you area week too early. This walk on my website is a fantastic walk with a rifiugio, but again it just states mid June as the opening time. We are having our holiday in lake Garda in early July and can not decide where to stay. We are in our late 60s but have walked most of our married life . We are looking for walk of about 8 miles with a bit of challenge with nice views of course. We stayed at Garda a long time ago so could you please reccomend at destination suitable. Hi Lillian, I would recommend Gardone Riviera or Salò. In Gardone there are many walking trails that take you from near the lake, up the hillside to Gardone Sopra. From there if you are feeling really energetic there are many routes that take you up into the mountains. Salò also has routes that take you up to these hills and mountains. For a less demanding walk you can the walk along the promenade that takes you all the way around the bay from the historic center, to the beach and on to Portese. Click on the icons on the map on this page and follow the links for some of the walks above Salò and Gardone. We are in Lake Garda now on the South West shoreline at Camping Fornella. We would like to do a 2-3 day walk staying along the way in huts or paid accom. We are reasonably fit and experienced walkers. Any recommendations? Much appreciated in advance. We would like to walk for a couple of hours near Bardolino. I have heard there are good paths in the hills with Great Lake views. Hi Roy – Ive just read your answer to Susan’s note which is really useful. We are staying in Bardolino in a few weeks time with our children who are 13 and 10 – we are all experienced walkers and happy to walk 10-15 kms no problem.In addition to the walk you mention up Rocca Vecchia; is there anything else you can recommend – even if we have to get taxi/bus to and from a different starting point? Thank you very much for your suggestion. We will take your advice. My wife and I are visiting may 28-30th. We would like a challenging hike with the highest/best view of the lake and towns for picture purposes. Any suggestions would be greatly appreciated. Hi Brian, I recommend a walk up Mount Pizzocolo. This route is perfect for you requirements. Very interesting site! I would love a recommendation for a short 2-3 hour hike somewhere near either Gargnano (where we are staying), or any of these areas we plan to visit Limone, Riva del Garda, Malcesine (not sure we can fit much more in). I am considering Ponale Trail – any other ideas? We are 6 adults in our early sixties, and our hiking level probably averages in the moderate level (maybe “easy” by Italy standards!). The only walks in this area that I have completed myself are Cima Comer and Campione to Monte Castello.I do wonder whether they might be slightly on the hard side of moderate, but you could just walk up to the hermitage on the Cima Comer walk. I haven’t done the Ponale trail yet but hope to on one of my future visits. Hiya my wife and I are staying in Malcesine 25/6 to 1/7 2017 looking for some nice walking locally both seasoned walkers but don’t mind anything, is there any guided walks in the area. Hi Peter, my walking experience around Malcesine is limited but I do know you can walk or take the cable car up Monte Baldo. This company may be able to help you with organised walks. Visit our page about the Monte Baldo cable car. Hi, Id like to get some tips for hiking trails. We are a group of four young people, age around 25. We are not looking for ferrta. We would like some ideas for trips approximately 6-7 hours and around 20 km. We want to see views over the lake, mountain panoramas and some natural interests. We have an accommodation in Riva del Garda but we can drive ourselves to some starting points within 30 min. I think maybe you should take a walk up Monte Baldo, or you could take the cable car and walk around on the top. I’ve not done much up there myself as the times I’ve been there has been too much snow, but the routes are very well marked out. Other walks within a 30min drive include Cima Comer and Campione to Monte Castello. Thses particular walks probably won’t take 6-7 hours but as you go up you can find detours on the very well marked out networks of walking routes. A walk up Pizzocolo will fulfill all of your criteria but it is probably an hours drive from Riva. Hi Jane, wherever you stay around the lake you will find fantastic walks. I haven’t walked from Riva personally but have had great feedback. Read the comments above for more info also this article about Riva del Garda. I am part of a group of secondary students who are planning our gold duke of Edinburgh expedition around Lake Garda. Our expedition has to last 4 days and we camp along the way. Would there be any routes you would recommend lasting this duration? and what areas would you recommend? We’re planning on visiting Lake Garda (possibly Riva del Garda) in late October for 2 nights only. Do you have any suggestions for a city that is easy to get in and out of by public transport with a decent day trail for some average hikers. Hi Pam, I would always suggest Salo…..it is the town that made me fall in love with the region. There is a good bus link to Desenzano where the train station is, it’s also just an hour from Verona or Bergamo airports. You can walk straight out of the town up into the hills of San Bartolomeo, walk to the far end of town (near the Hotel Laurin)and look for the marker 17 on the wall of a narrow road. Salo also boasts the longest lungolago and there is a very pleasant walk around the bay. Visit this page for more walks near to Salo. I would like to know if there is a nice walking way from Gardone Riviera to Toskolano Maderno. Last year we stayed at Toskolano Maderno and we enjoyed promenade there but this sommer we booked the hotel in Gardone Riviera. As we are really good “walkers”;) we would like to go to Toskolano Maderno every day , but I’m not sure if there is a walking passage between those two cities. I see only street on the map. I’m almost certain that your can walk from Gardone all the way around to Toscolano on the pedestrian walkway that follows the road. There are also routes up into the hills from Gardone to Toscolano. We are having our holiday in Lake Garda in early September and can not decide where to stay! We want to have a nice mix of challenging beautiful hiking days and a total relaxation/swimming/eating days…We were considering northern and western shore, but struggling to make a choice (everything looks too good). Ideally we’d stay in 2 different towns (not more, to avoid check-in/check-out hassle). Also, we are not driving, so the only option is public transport. And we will be coming from Verona. Which towns could be a good hiking base, but still with nice beaches? Also, we would fancy a day trip to Dolomites..is it worth it? Hi! We are a couple pretty fit coming to lake Garda in late May with our 9 month old baby. We are staying in Gardone Riviera for 5 days. There is a lot to do in the area it seems, but we would love to do 1 or 2 nice hikes. They cannot be too long because of the baby, also I would love a lake view. I tried clicking on a few of your links but cannot seem to find clearly what hike we could do (and where). Could you kindly provide us with some itinerary suggestions? Thanks so much !